Andy: [after catching her for shoplifting] The food is not the issue. It's about setting an example, right? Wendy: Sir, I'm not from around here. I can't be an example. 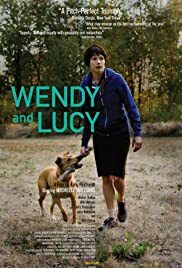 Q: Is "Wendy and Lucy" based on a book? Q: Who are Wendy and Lucy? Q: Does Lucy die in the end? Simple and quiet, W&L says more with less. The true triumph of this film is its ability to say so much about the cold, cruel reality of just how close some people are to breaking their banks and their hearts. What fascinates me is: there are a few big budget films out there right now - all scrambling desperately to capture the same themes as W&L - that have no concept of how real people really act and survive. Those filmmakers must be pulling their hair out screaming "how can she say it all with one woman and a dog, and I can't say a damned thing with all these great special effects???" That is the joy in this film. The simple, honest, brutal truth of now. Enjoy. 96 of 122 people found this review helpful. Was this review helpful to you?